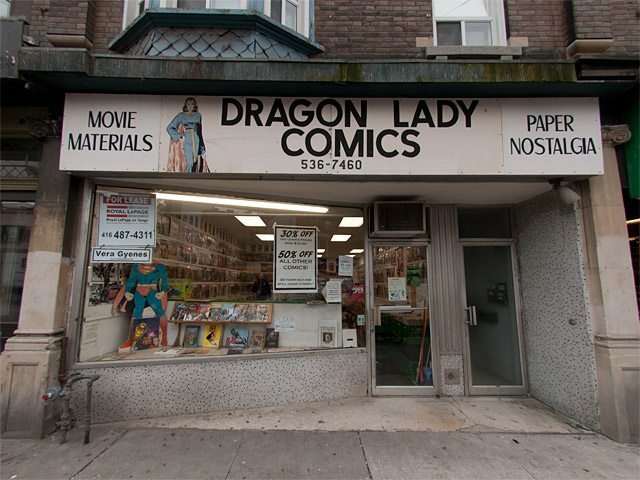 It’s a story we’ve heard too many times before, but that doesn’t make it any less troubling: after more than 30 years in business, Dragon Lady Comics will be closing its doors for the last time on February 1. According to manager Joe Kilmartin, a combination of factors led to the store’s demise, including a drop in foot traffic after repairs to the College Street streetcar tracks, an industry in flux, declining sales, and most directly, a recent increase in the store’s rent. As of July 2011, rent was raised about 25%, meaning they’re now paying $5,200 a month. Dragon Lady, located across the street from the Royal Cinema in Little Italy, has walls covered with vintage issues of Life, Time, and Rolling Stone. (A 1954 collector’s issue of the “gentleman’s magazine” Sir! features Marilyn Monroe on the cover, with various headlines asking things like “Can humans hibernate?” and “Why do couples swap their wives?”) Shelves are packed tightly with comics, and boxes overflow with them. Featured comics on “Dragon Lady’s Must-Read Shelf” include local fare like Scott Pilgrim and Kenk, offering customers a hint of native pride. Dragon Lady has been at its College Street location since 1996, but it originally opened in 1978 on Queen Street. Loyal customers like Norm Wilner, senior film critic for NOW magazine, have relied on the store’s supply of comics and “paper nostalgia” for decades. Wilner remembers finding old sci-fi and fantasy film magazines like Starlog and Fangoria at Dragon Lady in the early ‘80s. “I used to go there all the time when I was a kid,” he says. “It’s always been this comfortable, tiny, obsessive little place, which I like.” Now that he’s living in Kensington Market, the shop’s current location makes it easy for him to pick up the latest issues of Buffy the Vampire Slayer: Season Nine and other Joss Whedon spin-offs. According to Kilmartin, Dragon Lady owner John Biernat hopes to move his business online. Rather than hold a massive blowout sale, he’ll move the store’s stock to a warehouse. This news marks the third in a string of unfortunate announcements for Toronto bookstores. Earlier this week, 47-year-old west end mainstay The Book Mark announced they were closing, and Glad Day, Canada’s oldest gay and lesbian bookstore, is seeking a new owner. The good news, we hope, is that the year can only get better from here on in.